The MLK Jr. Regional Shoreline Park offers excellent views of shorebirds, waders, and dabblers during the winter months. Map and directions: We recommend that you include a visit to the end of Edgewater Drive, where it meets Damon Slough; the seasonal pond on the eastern side of Edgewater may contain all three teal species as well as many other dabblers and shorebirds. To reach the Shoreline, take the Hegenberger Road exit from I-880, head west, then turn right on Doolittle Drive, then right again on Swan Way, and the first left into the park’s driveway. Special Birds: During very high tides, Virginia Rails, Ridgway’s Rails, and Sora are often observable in the Shoreline’s Arrowhead Marsh. Large rafts of Common Goldeneye and scaup also float just offshore. Recent rarities include Yellow Rail, Black Rail, and a Nelson’s Sharp-tailed Sparrow. Best Time to Visit: High tides are best to see shorebirds and rails. Fall through spring are great for water birds. Conservation Notes: Until 1938, San Leandro Bay and its 1,800 acres of tidal marsh were a wildlife paradise, protected as a state wildlife reserve. By 1986, only 76 acres of tidal wetlands remained, the rest destroyed to create the Oakland Coliseum, Interstate 880, and the Oakland International Airport. When the Port of Oakland proposed destruction of several hundred acres of seasonal wetlands in 1986, Golden Gate Audubon led other environmental groups in suing the Port to preserve this important bird habitat. After 10 years of litigation, Golden Gate Audubon negotiated a settlement that left the remaining seasonal wetlands untouched, restored 72 acres of tidal and seasonal wetlands in San Leandro Bay, and deeded the restored wetlands to the East Bay Regional Park District to complete the Martin Luther King, Jr. Regional Shoreline Park. Golden Gate Audubon hosts monthly volunteer work parties, check the Volunteer page for more information. Map The Emeryville Crescent is accessible from I-80 by taking the Powell Street exit and heading west on Powell. The Berkeley Marina and Cesar Chavez Park are at the western end of University Avenue in Berkeley. 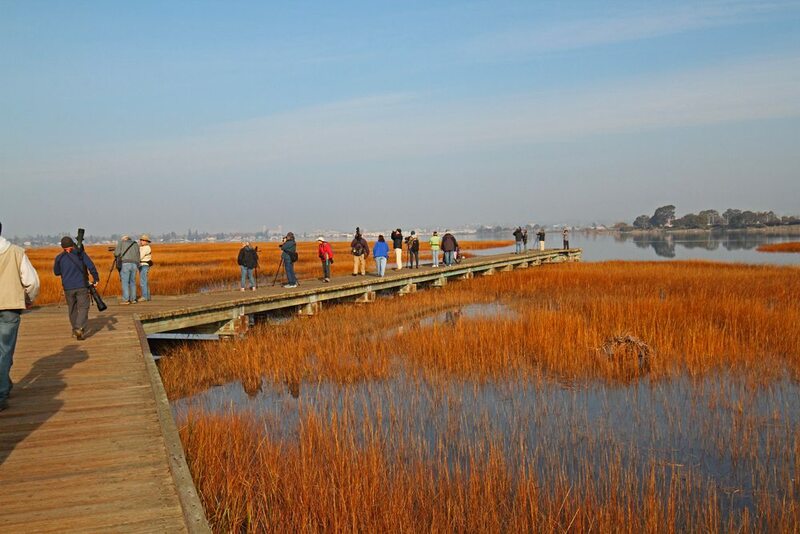 Best Time to Visit: Emeryville Crescent is a dense little salt marsh that attracts over-wintering shorebirds and large rafts scattered with goldeneye and Surf Scoters float just offshore. In early fall, Elegant Terns flock to the area before heading south. Special Birds: Head north on the frontage road to Emery Point (just south of the Ashby Ave overpass over I-80), which is a good place to look for rocky shoreline birds like Black Oystercatcher, Surfbird, Turnstones, and even Wandering Tattler. Continue north to University Ave., turn left, and follow the road to the Berkeley Marina and Cesar Chavez Park, where you may spot Burrowing Owls among the grasslands of the park while surveying the rafting birds offshore. The Albany Mudflats and the Albany Bulb – The Albany Mudflats and the nearby Albany Bulb are shorebird havens in the winter months. The mudflats are best during an ebbing tide, when the mud is exposed and birds are close to the shoreline. The area is accessible by taking the Buchanan exit from I-80 and heading west. Find parking along the right side of the road, along the mudflats. There is an observation platform from which you can scope the area, and many shorebirds can be seen, including Long-billed Curlew, Whimbrel, dowitchers, Black-bellied and Semipalmated Plovers, Western and Least Sandpipers and Sanderling, as well as many other shorebirds. You can continue along Buchanan to the end of the road, with parking on the left. From there, you can walk west along any of the trails, until you see a lagoon at the end, surrounded by a breakwater. At high tide, the birds that prefer rocky shorelines flock to the area, including Black Oystercatcher, Surfbird, and Turnstones. Bird List – Golden Gate Audubon’s checklist for the Eastshore State Park is available at the GGAS office and online. Management of the Site: A partnership of the Coastal Conservancy, California State Parks and East Bay Regional Park District manages the McLaughlin Eastshore State Park. Conservation Notes: Golden Gate Audubon conducted a census to create the bird list of this park and continues to comment to the agencies in regard to habitat at this park. Map To reach the north end of the Hayward Regional Shoreline, take the West Winton Avenue exit from I-880 and head west. At the end of West Winton, park in the East Bay Regional Park District parking lot and walk west to the shoreline. Best Time to Visit: In the fall, the area is a migrant trap, with many rare warblers, vireos, and sparrows in the anise near the eucalyptus near the parking lot. The site is a remarkable high-tide shorebird roost, with thousands of birds resting on the low-lying islands, often including Red Knot, Marbled Godwit, and Long-billed Curlew. Special Birds: In 2008, birders recorded Virginia’s and Black-throated Gray Warblers, Blackpoll, American Redstart, Eastern Phoebe, Dusky Flycatcher, and Brewer’s and Clay-colored Sparrows. On the bare hills to the south, you may find Horned Larks and, occasionally, Lapland Longspur in late fall. Frank’s Dump, a famous Bay Area birding spot, is reached by continuing along the shoreline until you reach an area of shallow ponds on the east side of the trail. Rarities from 2008 include Baird’s, Pectoral, Semi palmated, and Sharp-tailed Sandpipers. Management of the Site: The East Bay Regional Park District manages this park. Map To reach Pt. Pinole, from I-80 in Richmond, exit at the Richmond Parkway. From the Richmond Parkway, turn right onto Giant Highway and proceed to the park entrance. You may also want to visit the West County Landfill Loop trail, where our survey teams recorded Ridgway’s Rail, Spotted Sandpiper, and Peregrine Falcon, as well as tens of thousands of other shorebirds, ducks, and seabirds. To reach the Landfill Loop, take the Richmond Parkway west from I-80, turn right on Parr Boulevard, and follow signs for the Bay Trail, until you see a sign for the Landfill Loop staging area. Best Time to Visit: Fall through Spring are best for birdwatching along the North Richmond Shoreline. The Pt. Pinole Regional Park is good all year long. Special Birds: We highly recommend that you visit Pt. Pinole Regional Park, where trails offer views across Breuner Marsh (recently acquired by the East Bay Regional Park District), which can be densely packed with foraging shorebirds, including Semipalmated Plover, Red Knot, Red Phalarope, Lesser Yellowlegs, Black Oystercatcher, and Wilson’s Snipe. Management of the Site: The East Bay Regional Park District manages Pt. Pinole Regional Park. Conservation Notes: From September 2007 through August 2008, Golden Gate Audubon volunteers conducted a bird survey of the North Richmond Shoreline, between Point San Pablo and Pt. Pinole, and observed tens of thousands of shorebirds, waterbirds, raptors, and passerines. Map Park at Merrie Way. There is wheelchair accessible trail access from the Merrie Way parking lot. Best Time to Visit: Birding is good at this location all year. Special Birds: Over 200 species of birds have been recorded at this magnificent coastal birding spot in San Francisco. With Seal Rock in the Pacific Ocean to the west, Ocean Beach to the south, Marin Headlands to the north, and the city to the east, birders enjoy a dramatic backdrop and excellent view from the coastal trail while spotting pelagic birds, shorebirds, divers, gulls, terns, waders, and waterbirds. Woodpeckers, hummingbirds, hawks and passerines can be seen at Sutro Heights and along the Camino del Mar trail. Management of the Site: Land’s End is managed by the National Park Service, specifically the Golden Gate National Recreation Area. Sutro Heights is managed by the San Francisco Recreation and Parks Department. Conservation Notes: Golden Gate Audubon members made recommendations for the habitat restoration that is underway at Land’s End. Golden Gate Audubon volunteers work with the Parks Conservancy on habitat restoration along the Land’s End Trail. Best Time to Visit: We recommend that you time your visit with the outgoing tide, to get better viewing opportunities of shorebirds, and (when possible) the afternoon, so the sun will be at your back. Special Birds: Birders at this 24-acre bayside park have reported over 100 species of birds observed, including both Scaup, five species of Grebe, Brown Pelican, Double-crested Cormorant, Great Blue Heron, Great and Snowy Egret. Along the shore check for Black-bellied and Semipalmated Plover, Black Oystercatcher, Black-necked Stilt, American Avocet, Whimbrel, Long-billed Curlew, Marbled Godwit, Black Turnstone and a variety of peeps, dowitchers and yellowlegs. It can be a good spot to look for gulls too, including Mew, Ring-billed, California, Herring, Thayer’s, Western and Glacous-winged Gulls. Check the grasses for Black and Say’s Phoebe, Savannah Sparrow, White and Golden-crowned Sparrow, and Western Meadowlark. Rarities reported in recent years include the Eurasian Wigeon and Harlequin Duck. Management of the Site: The Port of San Francisco owns this property and Aquarium of the Bay, City College and A.Philip Randolph Institute manage and maintain the site. Map Golden Gate Park offers many excellent birding opportunities, including the “Chain of Lakes” west of Crossover Drive, Lloyd Lake, and the Buffalo Paddock. Here, we’re recommending a trip to the San Francisco Botanical Garden located on Ninth Avenue near Lincoln Way. Best Time to Visit: Join Golden Gate Audubon on a bird tour the first Sunday of the month from 8-10:30am. In winter look high and low to check the wide variety of trees, plants, and the ponds for migrants, residents and possibly a vagrant species of birds.. A wheelchair-accessible trail was recently improved. Public transportation is encouraged since there is limited street parking. The Garden is open 8:00 am – 4:30 pm weekdays or 10:00 am – 5:00 pm weekends located at Ninth Avenue and Lincoln Way. There is a fee for non-residents of San Francisco. Management of the Site: The San Francisco Botanical Garden manages this garden within Golden Gate Park which is managed by the San Francisco Recreation & Parks Department. Attached is their map of the gardens. Conservation Notes: Contact our volunteer coordinator regarding upcoming habitat restoration work parties in on the 3rd and 4th Saturday each month in Golden Gate Park. Map Three parking lots serve the park: one off Skyline Blvd. at Harding Park Rd. where the boathouse is located, John Muir Drive where there is access to the concrete bridge, and Sunset Blvd. which has trails leading to the wooden bridge and across to Harding Park Golf Course and habitat restoration site. A 4.4 mile paved path encircles the park and there are a couple picnic spots. Best Time to Visit: There are a variety of waterbirds in the winter, migrating and vagrant birds in the spring and fall and local breeding birds can be seen in the spring and summer. Conservation Notes: Golden Gate Audubon members have been visiting Lake Merced for over 100 years. Golden Gate Audubon participated in developing the Master Plan for Lake Merced. A nature center is planned for this park.